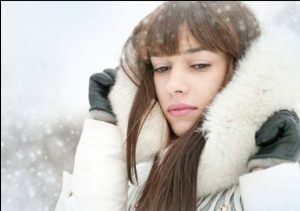 It’s a fact – winter weather can wreak havoc on your hair. Here are some easy ways to put the luster back in your locks. • Wash And Wear. And Wear. When you wash your hair too often, it strips out the natural oils from your scalp and hair, which also leads to dry strands and dandruff. Depending on the texture of your hair, it’s best to wash every other day or even every three days. Ask us about choosing the right gentle shampoo and conditioner formulas. A really hot shower feels good on a cold day, but if you want to care for your scalp, you should turn down the temperature of your shower. Hot water isn’t good for your skin or hair – it actually dehydrates and “cooks” the moisture out of your skin. If possible, let your hair dry naturally or keep your blow dryer on a cool setting. Also, wearing your natural style and avoiding heated tools like straighteners and curlers helps to prevent dryness and damage. It’s also best to avoid alcohol-based styling products. • Double Up On Conditioner. Conditioning during winter is a must! Using a conditioner after shampooing should be an important part of your hair routine. We recommend using a deep conditioner plus a leave in treatment such as Aveda Damage Remedy Intensive Restructuring Treatment that’s packed with quinoa protein to strengthen damaged hair. Aveda Dry Remedy Daily Moisturizing Oil can also instantly moisturize dry hair by over 40% – just by using a couple of drop a day. Ask your stylist about the best conditioning products for your hair type. Hair masks are a great way to nourish your hair in the winter. Ask us about products we carry such as Aveda Dry Remedy Mask, an intensive mask that moisturizes and helps seal in intense hydration, or ColorProof DeepQuench Moisture Masque that also helps to prolong color life. • Eat Balanced & Stay Hydrated. Eating a healthy diet full of vitamins and nutrients is the best way to keep your hair and scalp looking and feeling healthy. Also make sure you drink plenty of water to keep your hair and scalp hydrated.